And now I do, too! Saturday was quite the exciting day for me. 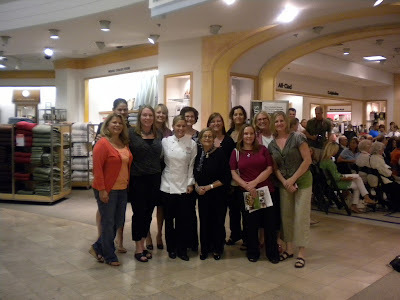 I was lucky enough to be invited to meet Cat Cora, who was in the Twin Cities to give a cooking demo and to promote her new book, Cat Cora's Classics with a Twist. Actually, the nice people with Macy's Culinary Council were gracious enough to offer me a press pass and VIP seating...and I certainly couldn't resist! I really wasn't sure what to expect---after all, I had never met an Iron Chef before! It turns out that Cat Cora was fascinating, not just because of her fame as a Food Network star, or because she is an accomplished cookbook author, but also because of her work with the "Chefs Move to Schools" program, part of Michelle Obama's Let's Move campaign. As a matter of fact, Cat had just been to the White House on Friday, along with hundreds of chefs from across the country, ready to take on the challenge of ousting childhood obesity. To further support the First Lady's initiative, the chefs are encouraged to adopt a school in order to support parents in the nutritional education of their children. Cat is doing her part by adopting her son's school in Santa Barbara. When she arrived, we, the invited bloggers, had a chance to have our pictures taken with her. I didn't get a chance to meet everyone, but, for the most part, these are the ladies of the Minnesota Blog Pantry. I did have the opportunity to chat with Crystal of Cafe Cyan and Jodi and Patricia from Two Girls Cooking. Hopefully, I'll be able to get acquainted with more of the women at future events. Oh, and I can't forget Sue Zelickson, the lovely woman in the front (standing next to Cat Cora). Sue is a longtime Minnesota foodie--a columnist for Minnesota Monthly and host of a radio show on WCCO. For her second recipe, Cat took an old family favorite and freshened it up....Grapefruit and Cherry Ambrosia with Honey Cream. It was terrific! Cat wrapped up her demo by taking questions from the audience. She talked about her four boys and how she connects with them while she's on the road, and she answered questions about her stint as an Iron Chef. For the record, she doesn't know the secret ingredient until the battle begins, but she has about 15 minutes to group with her team before she starts cooking. The chefs all go into it with a plan, so if the plan is "Greek cooking", for instance, then they just incorporate the secret ingredient into the pre-planned dishes. According to Cat, this works out 85% of the time. If the ingredient just doesn't work with the theme, then there is a "Plan B". Interesting stuff. Use avocados that are still a little firm. Pour a little olive oil on them. Sprinkle a little salt and pepper on top. Grill them for just 2 or 3 minutes. I topped mine with a little lemon juice...delish! Who knew that a cooking demonstration could be so enjoyable? Or that an Iron Chef could be so cordial? So cool!!!!! What else is there to say?! Love the last pic of you with Cat! Such a memorable experience for you!!!! Wow, I'm so jealous you got to meet an Iron Chef! I can't wait to try those avocados. Thanks for posting. Very cool indeed. Thanks so much for sharing your experience with us! I'm stoked to grill some avocados this summer! Great post! What a fun event. I was there too...missed meeting you. Next time for sure! I love your blog. "I Had a Delicious Time"
You certainly have been having some terrific experiences lately, wow. Thanks for sharing some tips, tricks and great recipes. Everything looks so luscious. Proof that you can grill everything! I tried this today and it came out so good! How exciting!! How did you get invited to such a cool event?